The Zune HD has seen modest price drops the last few weeks with the Zune HD 32 now available at the ever important $199 price point. With a lite dose of speculation, it now all makes sense seeing as there is clearly a Zune HD 64 launching in the near future. 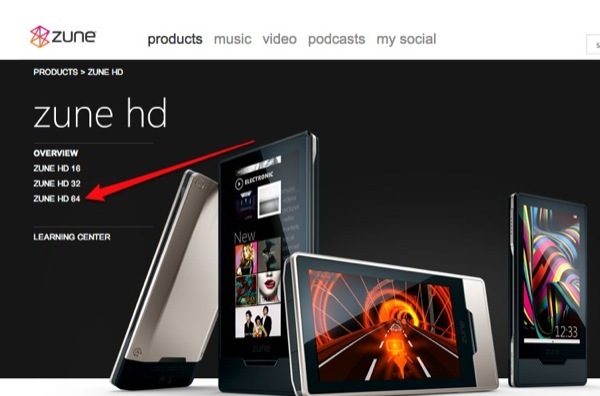 The Zune itself is going through a re-marketing phase now that Microsoft has another portable media solution in Windows Phone 7. It’s set to be the underacheiving older brother when the wunderkind WinPhone7 breaks cover and so it needs something to set itself apart from in the crowded PMP world. It seems like that’s initially going to be storage capacity with 64GB as the new top-tier.